Azure Batch supports authentication with Azure Active Directory (Azure AD). Azure AD is Microsoft’s multi-tenant cloud based directory and identity management service. Azure itself uses Azure AD to authenticate its customers, service administrators, and organizational users. By using integrated authentication to authenticate a user that is interacting with the application. An application using integrated authentication gathers a user's credentials and uses those credentials to authenticate access to Batch resources. By using a service principal to authenticate an unattended application. A service principal defines the policy and permissions for an application in order to represent the application when accessing resources at runtime. To learn more about Azure AD, see the Azure Active Directory Documentation. To authenticate Batch applications with Azure AD, you need to include some well-known endpoints in your code. The tenant-specific endpoint is required when you authenticate using a service principal. The tenant-specific endpoint is optional when you authenticate using integrated authentication, but recommended. However, you can also use the Azure AD common endpoint. The common endpoint provides a generic credential gathering interface when a specific tenant is not provided. The common endpoint is https://login.microsoftonline.com/common. For more information about Azure AD endpoints, see Authentication Scenarios for Azure AD. The first step in using Azure AD to authenticate is registering your application in an Azure AD tenant. Registering your application enables you to call the Azure Active Directory Authentication Library (ADAL) from your code. The ADAL provides an API for authenticating with Azure AD from your application. Registering your application is required whether you plan to use integrated authentication or a service principal. When you register your application, you supply information about your application to Azure AD. Azure AD then provides an application ID (also called a client ID) that you use to associate your application with Azure AD at runtime. To learn more about the application ID, see Application and service principal objects in Azure Active Directory. To register your Batch application, follow the steps in the Adding an Application section in Integrating applications with Azure Active Directory. If you register your application as a Native Application, you can specify any valid URI for the Redirect URI. It does not need to be a real endpoint. For more information about registering an application with Azure AD, see Authentication Scenarios for Azure AD. In the Azure portal, select your Active Directory. Copy the GUID value provided for the Directory ID. This value is also called the tenant ID. To authenticate with integrated authentication, you need to grant your application permissions to connect to the Batch service API. This step enables your application to authenticate calls to the Batch service API with Azure AD. In the left-hand navigation pane of the Azure portal, choose All services. Click App Registrations. Click the application and click Settings. In the API Access section, select Required permissions. In the Required permissions blade, click the Add button. Once you find the Batch API, select it and click Select. In Select permissions, select the check box next to Access Azure Batch Service and click Select. The Required Permissions windows now shows that your Azure AD application has access to both ADAL and the Batch service API. 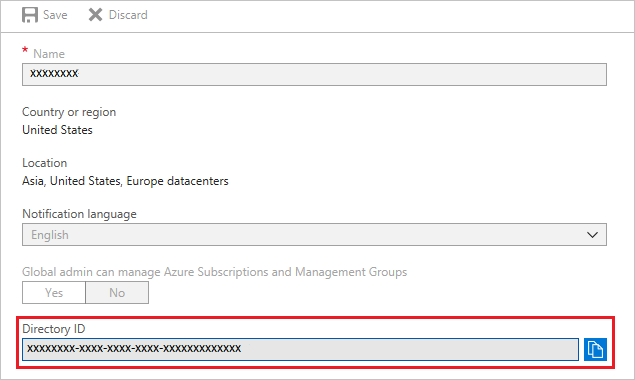 Permissions are granted to ADAL automatically when you first register your app with Azure AD. Request a secret key for your application. Assign an RBAC role to your application. When your application authenticates with a service principal, it sends both the application ID and a secret key to Azure AD. You'll need to create and copy the secret key to use from your code. Search for the name of your application in the list of app registrations. Click the application and click Settings. In the API Access section, select Keys. To create a key, enter a description for the key. Then select a duration for the key of either one or two years. Click the Save button to create and display the key. Copy the key value to a safe place, as you won't be able to access it again after you leave the blade. In the Azure portal, navigate to the Batch account used by your application. In the Settings blade for the Batch account, select Access Control (IAM). Click the Roles assignments tab. Click the Add role assignment button. From the Role drop-down, choose either the Contributor or Reader role for your application. For more information on these roles, see Get started with Role-Based Access Control in the Azure portal. In the Select field, enter the name of your application. Select your application from the list, and click Save. Your application should now appear in your access control settings with an RBAC role assigned. The code examples in this section show how to authenticate with Azure AD using integrated authentication and with a service principal. Most of these code examples use .NET, but the concepts are similar for other languages. An Azure AD authentication token expires after one hour. When using a long-lived BatchClient object, we recommend that you retrieve a token from ADAL on every request to ensure you always have a valid token. To achieve this in .NET, write a method that retrieves the token from Azure AD and pass that method to a BatchTokenCredentials object as a delegate. The delegate method is called on every request to the Batch service to ensure that a valid token is provided. By default ADAL caches tokens, so a new token is retrieved from Azure AD only when necessary. For more information about tokens in Azure AD, see Authentication Scenarios for Azure AD. To authenticate with integrated authentication from Batch .NET, reference the Azure Batch .NET package and the ADAL package. // Acquire the authentication token from Azure AD. To authenticate with a service principal from Batch .NET, reference the Azure Batch .NET package and the ADAL package. To authenticate with a service principal from Batch Python, install and reference the azure-batch and azure-common modules. Use the service principal credentials to open a BatchServiceClient object. Then use that BatchServiceClient object for subsequent operations against the Batch service. To learn more about Azure AD, see the Azure Active Directory Documentation. In-depth examples showing how to use ADAL are available in the Azure Code Samples library. To learn more about service principals, see Application and service principal objects in Azure Active Directory. To create a service principal using the Azure portal, see Use portal to create Active Directory application and service principal that can access resources. You can also create a service principal with PowerShell or Azure CLI. To authenticate Batch Management applications using Azure AD, see Authenticate Batch Management solutions with Active Directory. For a Python example of how to create a Batch client authenticated using an Azure AD token, see the Deploying Azure Batch Custom Image with a Python Script sample.